Varioman is the name given to the newly conceived packaging printing press from manroland web systems. Varioman means that manroland web systems has created a technology platform, which combines the benefits of varied technologies and processes while specifically avoiding the weak points inherent in other technologies and simultaneously providing top customer benefits. The pilot press is an offset gravure hybrid press, which prints films and provides mature design, system integration and comprehensive service and maintenance packages. 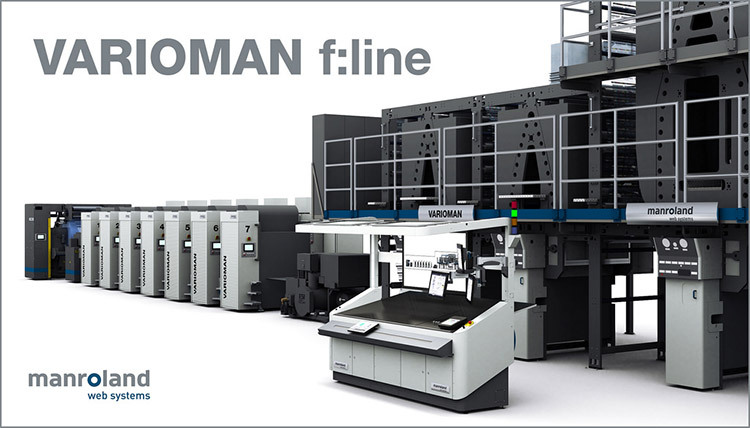 This new packaging printing press, the Varioman f:line, has been presented to numerous customers and interested parties from around the globe at the Technology Forum Varioman from 27th of February until 1st of March in Augsburg. Alexander Wassermann, CEO at manroland web systems, could welcome many international customers to this event. After the official greeting, the event started with directly switching into the topic: a new dimension for flexible packaging printing according to the motto „Boost Quality – Cut Costs“. Andreas Wecker and Wolfgang Hiesinger, Product Managers at manroland web systems, gave an overview on the recent market situation as well as on innovative and extraordinary solutions from manroland web systems at the field of offset printing. Following the first conceptual introduction of the Varioman, the new packaging printing press has been demonstrated to the guests in operation. Within the live demonstration, the guests could convince themselves from the performance of the Varioman and could gaze high-quality print samples. At the second day of the event, the visitors could join several specialist presentations. Peter Höringer, together with the manroland web systems partners Kodak, Jänecke & Schneemann und ESI, gave a deeper insight to technology aspects of the printing industry. Furthermore, the issues automation, service and the Varioman technology in detail have been examined more deeply. A factory tour at the manroland web systems facility has also caught the attention of the guests. “We are happy about the keen interest for the new Varioman. The event was a great success. We are moving on with the important and considerable discussions that came up at the event. We will use this for constantly meeting the market demands and the demands of our customers to be and stay the high performing business partner for the printing industry even in the future.” Wassermann confidently speaks about the event.